Celebrating the life of Betty Mossey, R.N. Obituary for Betty Mossey, R.N. Mrs. Betty (Stanhope) Mossey, R.N. passed away Saturday, June 30, 2018 at Our Lady of the Meadows. She was born in Berkshire, October 12, 1926, daughter of the late Merritt and Dorcas (Hammond) Stanhope. She graduated from the St. Albans Hospital School of Nursing in 1947, and was employed by the hospital (which later became the Northwestern Medical Center) for over 50 years, mainly in the surgical suite and operating rooms. She was a member of the First Congregational Church, and the Veterans of Foreign Wars Aux. Unit #758. October 11, 1947, she married Stanley Mossey. Mr. Mossey predeceased her January 29, 2009. Betty will be remembered for her countless hours volunteering at the Bingo and dinners, at the VFW and Franklin County Senior Center. 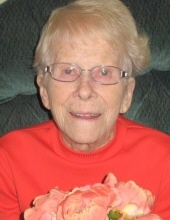 She loved baking, dancing and going on trips with Stanley. Betty is survived by her children, Chris Mossey of Brookpark, OH, Lisa Mossey of St. Albans, and Kim Foss and her husband Roger of St. Albans, her grandchildren Rachel Campbell and her husband Todd, Nick Foss, Jayson and Christine Vallee, her great-grandchildren Curtis Campbell, Joe Putnam, Emily Campbell, Beth Campbell, Matthew Campbell, Emma Foss and Amelia Vallee. Besides her parents and husband Stanley, she was predeceased by a great-grandson, Jacob Putnam and her siblings Spencer Stanhope, Pauline Deuso, and Barbara Lovelette. To plant a tree in memory of Betty Mossey, R.N., please visit our Tribute Store. "Email Address" would like to share the life celebration of Betty Mossey, R.N.. Click on the "link" to go to share a favorite memory or leave a condolence message for the family.